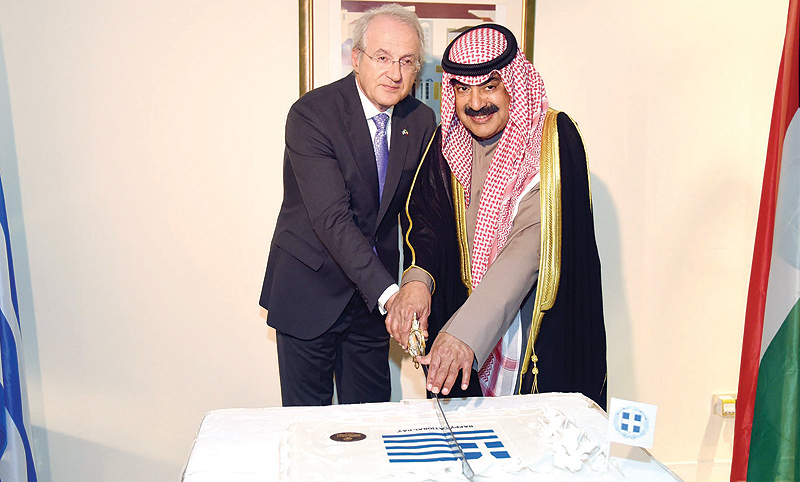 “We had expected and hoped there will be steps to defuse the tension in the region,” Jarallah said in a statement to reporters on Monday following his participation in a reception held by the Greek Embassy in Kuwait on the occasion of the European country’s national day, adding that this recognition will fuel tension. He stressed that Kuwait considers the Golan Heights a Syrian territory, affirming that this move is a violation of international law and Security Council resolutions, particularly resolution 497, which calls on Israel to cancel the 1981 annexation of the Golan Heights. Jarallah pointed out that this recognition would undermine the role of the US as a mediator and sponsor of the peace process in the region, calling on the Americans to reverse this step, which will result in consequences and negative reactions. Meanwhile, Jarallah said that US Secretary of State Mike Pompeo’s recent visit to Kuwait was an opportunity to discuss a host of issues including the proposed Middle East Strategic Alliance (MESA). There has been a progress in discussion over MESA with new ideas on the table, Jarallah told reporters. There are new ideas proposed by the US and Saudi Arabia, said Jarallah, adding that there would be a meeting for all parties of this alliance to discuss these ideas thoroughly in a drive to enable the launch of MESA.